Autumn Dot to Dots - NEW! Pirate Dot to Dots - NEW! What are these oranges sitting in? Join the dots to find out! Young children can practice their pencil skills and counting by following the numbers 1-10 to draw the base on our cauldron dot to dot. 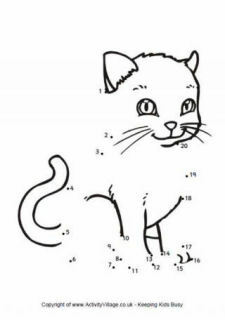 Here's a challenging dot to dot puzzle for older kids. Can they join all the dots correctly to form a picture of a Chinese fan? Can the kids use their counting and drawing skills to follow the dots and complete the missing tail for this lovely fox? Practise pencil control and early counting skills by following the numbers 1-10 to draw the body on our guinea pig dot to dot. Then get out the crayons and colour the guinea pig. Join the dots and follow the simple outline on our Guy Fawkes hat dot to dot for a fun Bonfire Night activity. 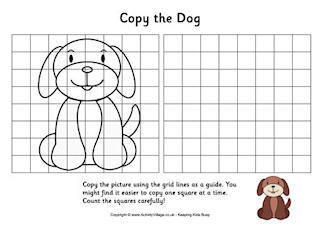 Children can colour the picture afterwards. There are 20 dots for the children to join together to complete the hamster on this fun dot to dot puzzle. Create for counting and pencil control skills. This hedgehog dot to dot has numbers to follow from 1 to 30, so it's a little more challenging for older kids and a great way to practise numbers and pencil control! You can choose from three versions of our horse dot to dot puzzle. Follow the numbers 1-25 or the letters of the alphabet in lower or upper case to complete the horse. Our Jack o'lantern dot to dot is a pencil skills, counting and colouring activity in one and so much fun children won't notice they are learning! Join the dots to reveal the native New Zealand bird, the kiwi. Join the dots to complete the Mayflower ship, ready to carry the Pilgrim Fathers to America. Children need to follow the numbers 1 to 20 to complete the outline of this funny mole! Here's a dot to dot featuring Creech, who looks he might be hiding inside Tripp's monster truck! Join the dots to find out. It looks like Creech is hiding in this picture, but the kids will have to join the dots to find out where exactly he is hiding! Children need to be able to count to 20 as they join the dots to draw in the tunic on our Native Amerian girl. Testing pencil control and counting skills our pig dot to dot will have your children learning without knowing. This Pilgrim dot to dot puzzle is a great way to keep young children busy over Thanksgiving lunch. They need to join the dots 1 to 20 to complete the dress and then they can colour in the pilgrim. This pilgrim hat dot to dot has a very simple outline to follow making it a perfect activity for young children this Thanksgiving. This pirate dot to dot practises pencil skills and counting at the same time, but it's so much fun the kids won't notice they're learning! Our pirate hat dot to dot has a simple outline to follow, making it a good choice for young children. When they've finished they can colour in the picture! Young children can practise their pencil skills and counting by following the numbers 1-10 to draw the bottom of the pirate ship on this dot to dot. The very simpe outline of our poison bottle dot to dot makes it a good choice for young children. When they have finished joining the dots they are left with a spooky, Halloween picture to colour! Join the dots (from 1 to 15) to make a beautiful poppy for Remembrance Day. This cute squirrel is missing a bushy tail! Can the children join the dots carefully to complete it? They can colour in the picture too. This strawberry dot to dot will help children practise counting numbers up to twelve as they join the dots to complete the yummy looking strawberry. Our sunflower dot to dot asks children to join the dots 1 - 20 to draw in petals and a stem for this sunflower. Make sure you have a yellow crayon ready to colour those petals nice and bright. 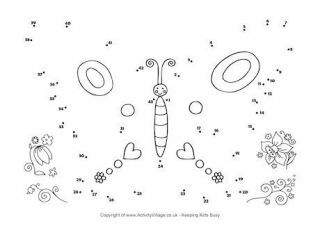 Can the kids join the dots from 1 to 20 to complete the tortoise's shell on our dot to dot puzzle? Complete the treasure chest by joining the dots from 1-15 - it's great for practising counting and pencil skills. 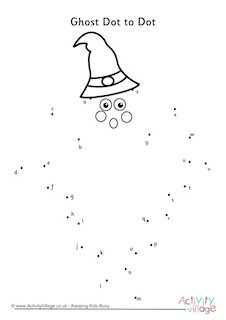 Our witch's hat dot to dot tests children's counting from 1-20 as they follow the dots to complete the outline of the hat. They can then get out the crayons and have fun colouring in the starry hat.